This post is sponsored by the American Cancer Society; however, all thoughts and opinions expressed are my own. Cancer is one of those diagnoses that I think that most of us have been affected by in one way or another. 1 in 3 people will be diagnosed with cancer at some point in their lives which is a pretty staggering and scary statistic. Cancer has caused much heartbreak amongst my friends and family, especially in the past few years. I’ve seen friends lose their parents, have had a childhood friend who is bravely fighting cancer, while others have went through tough treatments to claim victory over cancer that was ravaging their body. Whether you’ve been personally affected by cancer or not, there are many everyday habits that we can start doing today to help reduce the risk of cancer. Did you know that about 42% of cancer cases and 45% of cancer deaths in the United States are linked to modifiable risk factors? While the cancer death rate is decreasing, there are so many things that we can do on a daily basis to help reduce the risk of cancer for ourselves and our families. 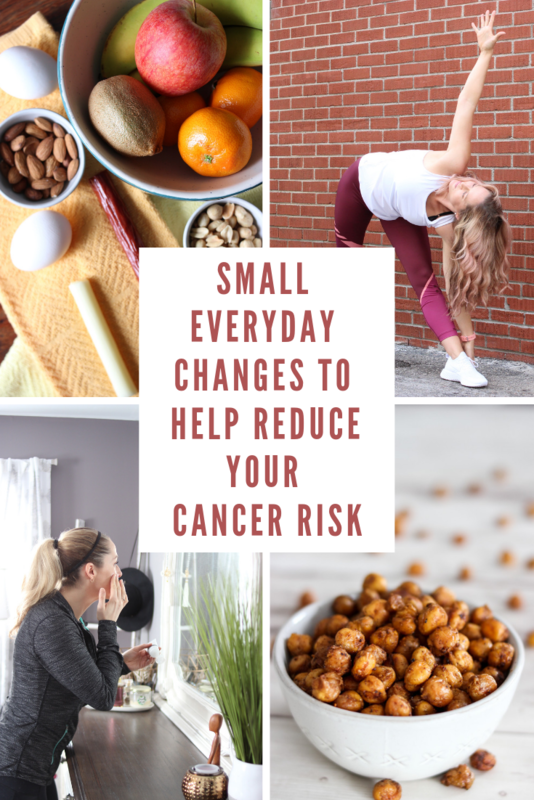 In honor of February being National Cancer Prevention Month, I want to share some small everyday changes that I do daily with my family to reduce our cancer risk. I’ve also included one of my favorite recipes that is packed with lots of good-for-you ingredients! Staying physically active is one of the most pivotal ways you can help reduce your risk of cancer. For most, we live quite sedentary lives, especially those of us with office jobs. Sitting for long periods of time has even been linked to a greater risk for cancers like colon, endometrial and lung cancer, so daily movement through your day is a must! It’s recommended for adults to aim for at least 150 minutes of moderate intensity or 75 minutes of vigorous intensity activity each week. Being physically active doesn’t mean you have to have a gym membership — simply finds ways to add movement into your everyday routine. Park at the back of parking lot. Walk or bike to destinations when possible. One of our weekly highlights is to round up our kiddos and walk downtown to the parks and play with the kids. Take a family walk after dinner (this is a great habit to get into with your family and one of my favorite ways to bond with my kids). Wear a fitness tracker that reminds you to move. Find an activity that you enjoy and love to do! The more you enjoy something, the more likely you will be to continue to do that activity. Find a fitness buddy! Having someone to keep you accountable and encourage you to stick with it is a must. When I’m not feeling motivated, a text from a friend always gets me moving! Roll out a mat or blanket and do some yoga or gentle stretching. 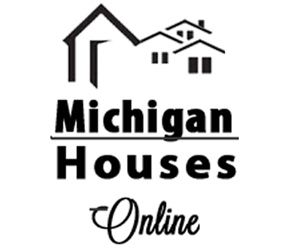 You can easily find videos online for simple to more vigorous routines. Even better: involve your children to encourage healthy habits when they’re young. Not only does staying active help reduce your cancer risk, but it’s a great way to release stress, and for me, it increases my happy good-for-you mood boosting endorphins. When choosing foods, be mindful to choose foods that are nutritious and low calorie. No single food can protect you against cancer by itself, but research has shown that a diet filled with a variety of vegetables, fruits, whole grains, beans and other plant foods, as well as being low in processed meat and red meat helps lower risk for many cancers. 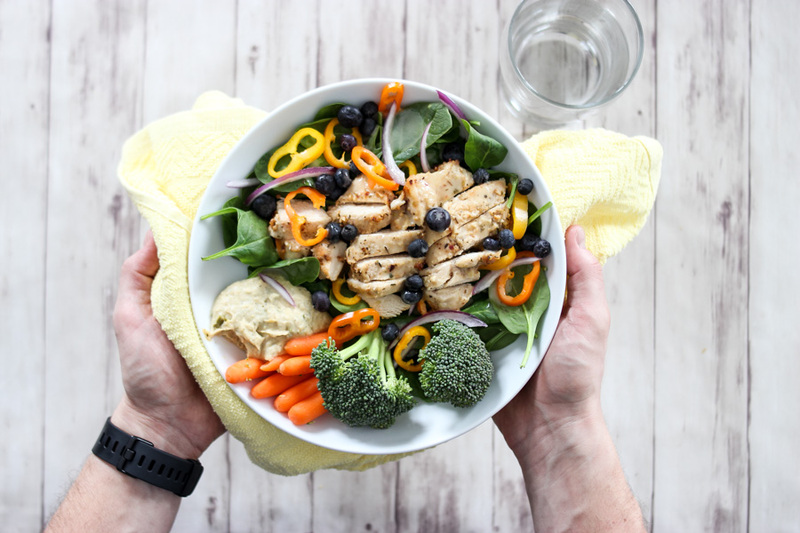 A good rule of thumb: half your plate should be veggies or fruit, a quarter filled with whole grains (quinoa, brown rice, whole-grain bread), quarter with lean protein (like chicken, turkey, fish) and a very minimal amount of sugar/saturated fat foods. Fill your plate with lots of colorful, antioxidant rich foods! For snacking, healthy snacks are a great way to add beneficial nutrients into your diet and great way to satiate your hunger between meals. A few of my favorites are fresh fruits, especially berries that are loaded with tons of antioxidants and a hefty bit of fiber, smoothies as they are a simple way to sneak in extra veggies and to take on the go (plus, my kids love them), hard-boiled eggs, nuts and roasted chickpeas! 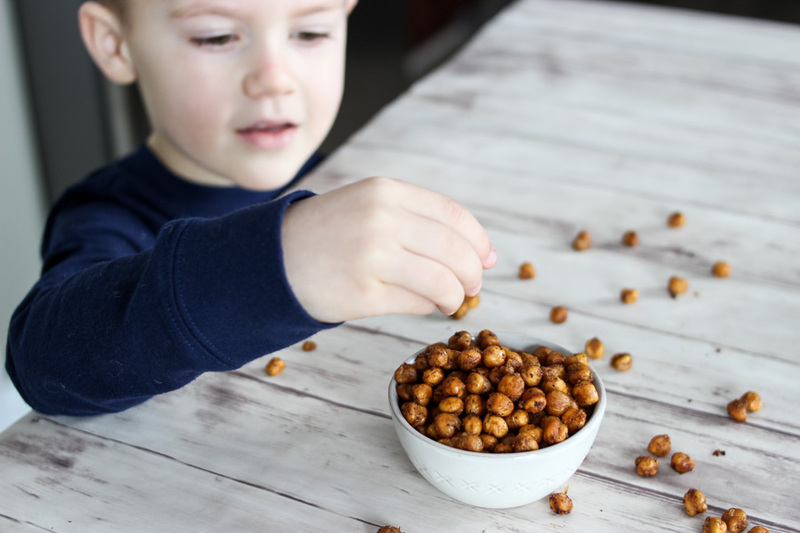 These roasted chickpeas are a simple to make snack that packs a powerful punch of fiber, protein and phytonutrients. They are great for snacking on their own or to top a salad to bulk it up. 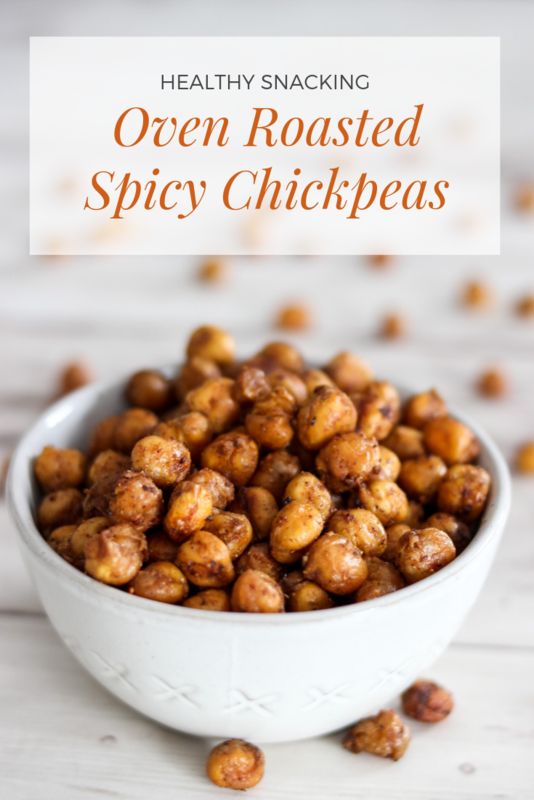 A small handful of these crunchy chickpeas are a great midday snack to hold off hunger (and much healthier than high fat potato chips) and prevent mindless snacking. Mix all seasoning and avocado oil well. Rinse and drain chickpeas. Add chickpeas to seasoning mix. Spread chickpeas on cooking sheet covered with parchment paper. Bake for 25 minutes, stirring half-way through. Chickpeas will be browned and firm when done. Being overweight or obese has been linked to an increased risk for many types of cancers. 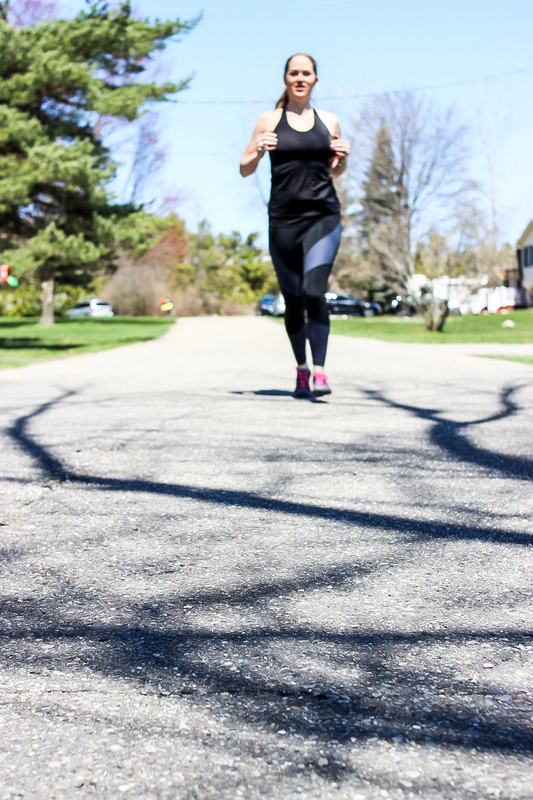 Through the practice of incorporating more movement into your daily routine and eating a healthy, balanced diet, maintaining a healthy weight can be achieved. If you’re struggling with your weight, taking small steps daily by implementing one healthy habit at a time or making small changes to your diet is a great way to start your journey towards a healthier weight. Skin cancer is the most common cancer in the United States. In fact, more skin cancers are diagnosed in the US each year than all other cancers combined. Most skin cancers are caused by exposure to UV rays from the sun. Using skin protection, such as sunscreens (at least SPF 30), year-round is incredibly important for reducing your skin cancer risks. One great habit to get into is to add a daily facial moisturizer with a built-in sunscreen to make using it daily simple to add into your routine. Smoking is by far the leading risk factor for lung cancer and has been linked to cancer of the mouth, kidney, liver, bladder, and more. There is so much support and cessation options available, so please talk to your doctor! Excessive alcohol consumption has also been linked to cancers and many other health problems as well. Alcohol is damaging to body tissues and can even have an effect on your hormones, absorption of nutrients and contribute to weight gain. For more information about cancer risk factors, healthy living tips and screening information, check out American Cancer Society at Cancer.org/healthy. Have you or someone you love been affected by cancer? I wish they really knew what caused cancer. Unfortunately, until they figure it out, all we can do is try our best to take care of ourselves. These are such great tips! 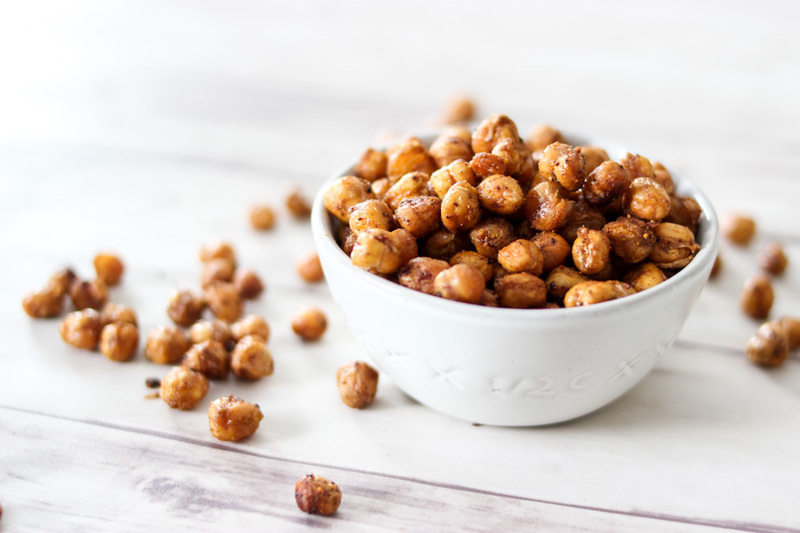 That chickpea recipe looks to die for too, such a yummy snack.